Congress • Utahn introduces bill to require parental consent after incident with daughter. 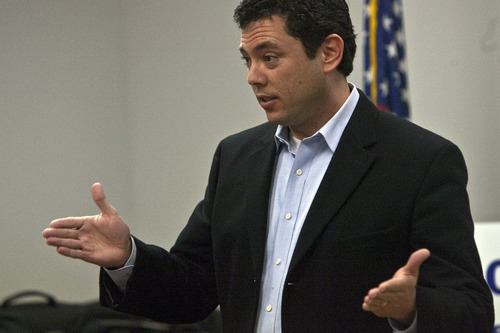 Tribune file photo U.S. Rep. Jason Chaffetz, R-Utah. 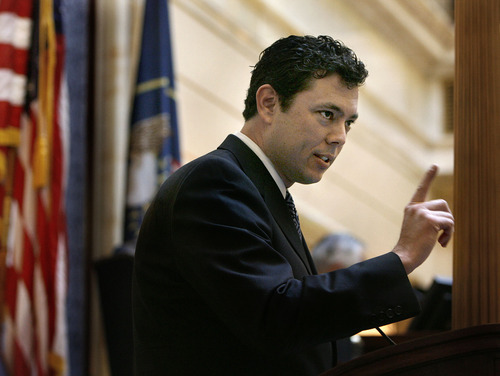 Chris Detrick | Tribune file photo Rep. Jason Chaffetz joined fellow Republican lawmakers in calling for big cuts in federal spending. The Utah congressman is shown here at a recent town hall meeting in West Jordan. Washington • After his 15-year-old daughter was whisked away from her mother for a pat down at Ronald Reagan International Airport, U.S. Rep. Jason Chaffetz says he's had enough and introduced legislation this week to bar pat downs of minors without parental consent. Chaffetz, R-Utah, the chairman of an Oversight and Government Reform subcommittee that watches over the Transportation Security Administration, says his wife and two daughters were flying to Utah from Washington a few weeks ago, when they refused to go through whole-body imaging machines, which the congressman has railed against as intrusive. An agent moved daughter Ellis to another location and patted her down, while Chaffetz's wife, Julie, was sidetracked by her own screening, Chaffetz says. "I am so furious with them I can't even see straight," Chaffetz said Thursday. "They should not be taking minors by themselves for pat downs." The new legislation would make it so that TSA can't pat down a minor unless a parent gives consent and is present for the screening. If a minor is traveling alone, a representative of an air carrier must supervise the pat down. Chaffetz also sent a letter to TSA Administrator John Pistole on Wednesday after a video surfaced showing a 6-year-old girl being frisked by agents despite a protest from her mother. "The agency must get serious about the manner in which it seeks to balance national security with personal privacy," Chaffetz wrote to Pistole in requesting a report on the incident. "At the very least, it cannot continue to operate under the belief that little girls and handicapped children pose such a serious threat that [agents] must abandon all manner of decency when interacting with them." TSA spokeswoman Carrie Harmon said the agency doesn't comment on pending legislation. As for the incident with the 6-year-old girl, the agency says it reviewed the screening and determined that the officer followed the correct procedure. But the agency adds that it is reviewing its "one size fits all" system for low-risk travelers such as young children and may make changes. Chaffetz has introduced legislation to bar whole-body imaging machines, which can peer through travelers' clothes, as primary screening tools and has been a constant critic of the agency. The congressman had his own run-in with TSA in 2008, when he refused to go through a body-imaging machine and then complained about an aggressive pat down.